Getting medical care is no fun. Especially when you’re too sick to drive, need surgery or forget to bring your ID card to the doctor. But you don’t have to worry—we have benefits to help with all of that and more. 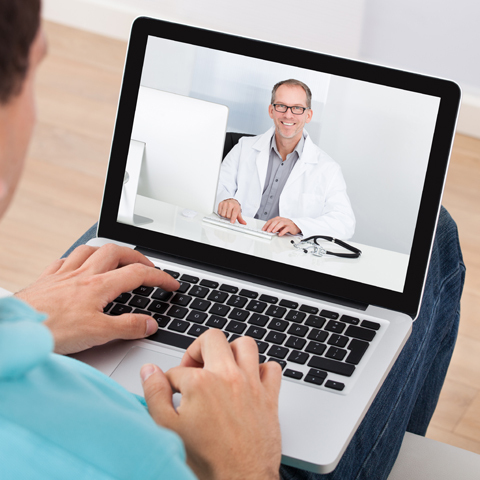 If you haven’t taken advantage of time- and stress-savers like Virtual Visits, Health4Me and Best Doctors, you should! Here’s why. Skip the lines at the doctor’s office and connect with a board-certified physician 24/7 from the comfort of your home with Virtual Visits. Visits only take 10 – 15 minutes, and you can connect with a doctor via your computer, smart phone or tablet. And you don’t need to schedule an appointment ahead of time. Just have your medical ID card, credit card and pharmacy location on hand to register and complete your visit! These are just a few of the many things a doctor can help you with. And if you need a prescription immediately, the doctor you consult with can call it in. You have two options to register with when you use Virtual Visits—Doctor on Demand or AmWell. Both providers charge less than $50, and you can use one or both services—the choice is yours! Log in to myuhc.com or the Health4Me app to start your Virtual Visit. If you have questions, call the myNurseLine at 1.844.234.7924 or email customer service at Advocate4Me@uhc.com. Instead of spending time calling the doctor’s office to get your medical information, download the Health4Me app so you can pull up your health information with the tap of your finger. It’s helpful when you need to find your medical ID card, check claims or find a doctor in your area, and you don’t have time to waste. You can download the app in the Apple iTunes App Store or from the Android Market. If you’re preparing for a major surgery or have a serious health condition, save time and get a second opinion with Best Doctors. It takes seconds to make a request, and you don’t have to travel to the doctor’s office or hunt down your files. You’ll be connected with top specialists who will offer you their expert opinions on your diagnosis or treatment at no cost to you. Reach out to Best Doctors here. For more information, check out the Best Doctors website.